This mallet head styled putter from Ping had the best feel off the putter face of all the putters tested, that is to say – butter. It just jumps off the face with top spin and rolls great. The head is black and slightly offset to assist with getting the ball rolling with topspin. Alignment is easy due to a white alignment line – easily visible off the black mallet head. 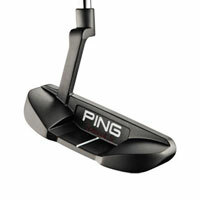 The face of this putter is not grooved or textured at all which surprised me considering how good it felt at impact. The insert is made from thermoplastic elastomer and gives a solid and soft feel at the same time. The price is exceptional at only $129.